This review is from Vicki Salisbury. House of the Dead is one of my favourite arcade game franchises and is without a doubt the first arcade machine I will look for or make a beeline for. It seems to be very popular at the likes of Play Expo as there is always a sizeable crowd around it. It can be nearly impossible to find your way to the front of the queue to play it! The game itself is a first-person shooter game where you assume the role of the agents (Thomas Rogan and his new partner G) trying to save Rogan’s fiancée Sophie from the monsters created by Dr Curian, your typical psycho mad scientist boss hell-bent on destroying the world as we know it. Whilst you can play this as a 2 player game I personally prefer to play alone and have been known to dance around in front of the arcade machine wielding both guns totally immersed in the games. Whilst this game may not be able to compete with the graphics or the complexity of other shooter/zombie games that are on the current market, for its grand old age of 20 years old this game is still an excellent addition to any collection. It can also be found on PC and whilst I have played it in that format you can’t beat the old fashioned upright cabinet for the best game play experience. The game itself is relatively short with only 4 bosses with the final boss being played a second time to complete the game. The game can easily be completed in one sitting taking less than an hour of game play to complete. 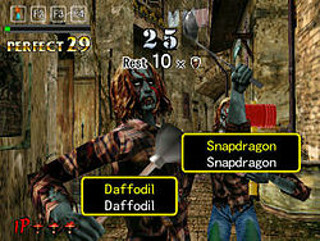 In the game play you can only hold 6 rounds at a time so you have to be quick in reloading your gun as this requires a shot to the “off-screen” section of the arcade machine – which if you have the undead descending on you in force you want to be as quick as you can to stop you from losing any of your life power. You can gain your life power back around the game by collecting health boxes which will restore you. They can be few and far between so you are best to not rely on these. Use your bullets wisely when trying to kill your enemies. It can sometimes be a method of trial and error in House of the Dead as you need to work out where each character’s weak spots are. There will be a point that will have maximum impact from just the one hit. If you shoot the arm of the zombie you are likely to just blow the arm off and slow the zombie down for a second or 2 which enough to reload your gun. If you are a good shot and can aim straight at their head you are likely to take them out much quicker. This is the same for defeating the bosses – work out where to hit them and then go to town on it until you can kill them. There’s also a spin off called Typing of the Dead, available on various platforms but I played it on the Dreamcast. In this you battle against your opponent to type the word as quickly as possible in order to kill the creations and get the higher scores. The game is the same as the arcade game overlaid with the typing element rather than the shooting one. This has brought a popular game into the learning and development of children helping them with both their spelling and their typing skills but under the guise of fun and killing zombies! Brilliant! 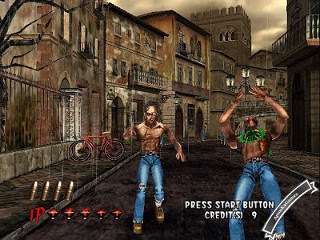 House of the Dead got a very good reception upon its initial release and so the following year House of the Dead 2 was released followed by House of the Dead 3 in 2002. Whilst the graphics are severely lacking in this game it is an extremely fun way to spend half an hour on a rainy day. I cannot recommend enough that you wait in the line for your chance on this classic game! House of the Dead 2 is one of my favourite shooters of all time and still holds up well on the Dreamcast today. Keep an eye out for the Dreamcon Wireless Gun modification that’s in development to allow a light gun to work on a modern TV (technically it uses a Wii sensor bar, but an impressive achievement).